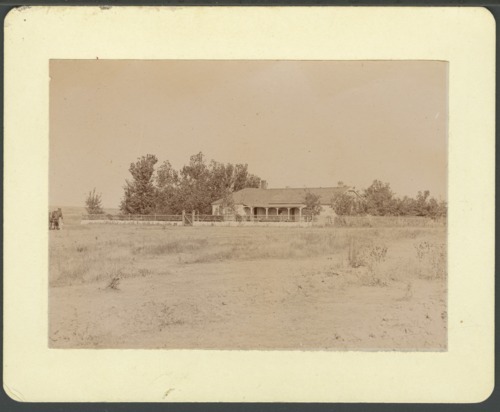 This is a photograph of the house on the Pratt Ranch [Cottonwood Ranch] near Studley in Sheridan County, Kansas. Built by Abraham Pratt and his two sons Fenton and Tom, it consisted of the stone house and at least one outbuilding of sod, which was used as a stable. A sod-walled corral was constructed near the stable. A small, wood-framed structure, which was used as a bathhouse and toilet, was located near the house in the 1880s and still exists today at the ranch. In the late 1800s a natural spring northwest of the house was modified to carry water into a storage cistern from which a pipeline was constructed to provide running water in the house. Fenton, Tom, and Abraham became successful ranchers, raising Merino sheep. In 1982 the state of Kansas purchased approximately 23 acres of the original John Fenton Pratt ranch, and operated the Cottonwood Ranch State Historic Site. It was listed in the National Register of Historic Places in 1983. The site is now operated by the Kansas Historical Society with support from the Friends of Cottonwood Ranch; added to the National Register fo Historic Places in 1983.